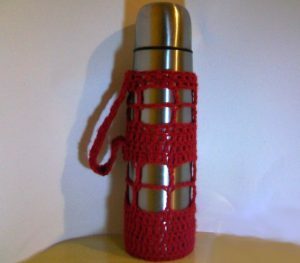 I have a nice steel thermos with a sleeve that had a small carrying strap. That sleeve seemed like it would be useful until the first time I used it, and my thermos full of tea slipped out of the sleeve and clattered to the ground. Since then, I’ve been meaning to make a cozy with a bottom for it. This cozy is easy and quick to make and will make carrying your drinks (or soup) easy as pie. Need help understanding the abbreviations and symbols? Check out the crochet abbreviation chart. Finish off and sew strap to cozy with a yarn needle. Need help while crocheting? Feel free to leave a comment below and I’ll help you out! This entry was posted on Tuesday, May 10th, 2016 at 12:00 AM by Candace	and is filed under Free Crochet Patterns. You can follow any responses to this entry through the RSS 2.0 feed. You can skip to the end and leave a response. Pinging is currently not allowed.